We offer an extensive range of timber flooring, starting from inexpensive DIY floating floors up to quality timber floating floors. We also have all of your timber flooring accessories and floor care products. Our Mobile Showrooms can visit your home and help match your preferred style and colour of timber to your furniture and home decor. We can do a free measure and quote on the spot. Call us on 13 13 78 to make an appointment. Engineered Timber Floors are made from Real Timber. They offer the luxury of real wood in your home with a natural looking finish and high stability. Affordable solid flooring that resembles hardwood with a high level of strength and durability. Stunning Laminate is the affordable, high-performance floor to compliment your home. At Little Do’er Carpets, we offer an extensive range of engineered and laminated wood flooring in Sydney, starting from inexpensive DIY floating floors up to quality timber floating floors. We also have all of your timber flooring accessories and floor care products available as well, so maintenance is quick and easy. In the last 10 or 20 years, timber floors have come a long way and today we have many environmentally friendly options available for both residential and commercial properties. The main two categories of eco-friendly timber floors are either laminated or engineered wood flooring in Sydney. Laminated wood flooring, Sydney: Laminate flooring is made of compressed wood fibres, is very cost effective, is easily installed and can be installed in any space where it won’t be subjected to high moisture levels. Engineered wood flooring, Sydney: Engineered wood flooring is made from plywood with a top layer of hardwood, it is slight more expensive than laminate flooring, but stands up much better in high moisture environments than laminate flooring. Commercial bamboo flooring, Sydney: It is no secret that bamboo flooring is made from compressed bamboo, an eco-friendly material that is rapidly becoming very popular. It is a serious option to hardwood timber flooring in Sydney as it can be more resistant to scratches and dents than hardwood, is cheaper and easier to maintain. Commercial timber flooring, Sydney: In commercial buildings you can opt for laminate, engineered or commercial grade bamboo flooring in Sydney, depending on your budget and needs. 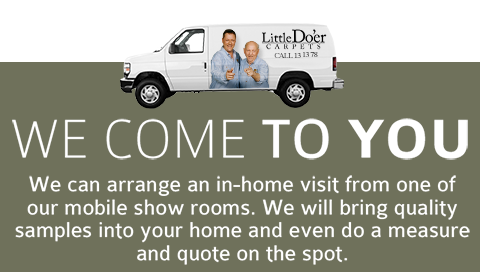 At Little Do’er Carpets, we are experts in laminate, engineered and bamboo flooring installation in Sydney and our mobile showrooms can visit your home or business and help you match your preferred style and colour of timber to your furniture and decor. We can do a free measure and quote on the spot. For more information on timber flooring in Sydney, or to request a visit by our mobile carpet showroom in Sydney, call Little Do’er Carpets (Flooring expert contractors/installers Sydney) on 131378, email us at info@littledoer.com.au or complete our online enquiry form to make an appointment.